It’s arrived. 30 Days of Baking is over! That exclamation mark does not mean I’m glad it’s finished, by the way. There isn’t a sigh of relief leaving my throat (although I think I’ll enjoy relaxing as soon as I get home from work today) because I’ve really enjoyed this challenge. Yes, I’ve had evenings where I’ve started to relax and then, like an alarm bell, CAKE! enters my mind (like it ever left it!) and I’ve had to get up and make a cake, but once I started it was a pleasure and a privilege to be making yet another cake for yet another person, all in the name of charity. I’ve been wanting to say throughout the month that this hasn’t happened yet, or that hasn’t happened, but I am a little superstitious and didn’t want to tempt fate. So now I can say: I didn’t burn myself once! All cakes have been successful enough to give away! And until last night, no cake had sunk! Yes, last night’s cake sunk. It’s buried in a lot of icing though, so who will know? Or care. I’m going to do another post later on about my thoughts on the challenge, what I liked, didn’t like so much, learnt etc. For now, let me introduce the last cake. It was a chocolate fudge cake from my book which I altered to add orange zest to the cake, and orange chocolate to the icing. I also decorated with chocolate fingers. I’ve seen photos of cakes like these and they look so effective but simple to achieve. It’s a return to my attempted delivery to the police station (see Day 5). The goods I delivered on Day 5 definitely made it into the bin. They could have been poisoned, or explosive, or who knows what? As my mum said, the police don’t get many nice things left for them (you can use your imagination there) so I should have expected something like that. She has work links with the police station so promised them another cake (thanks mum!) and they kept asking her when it would be delivered. She is delivering it this time, so it doesn’t go in the bin. They are lucky because its a tasty smelling and looking cake. 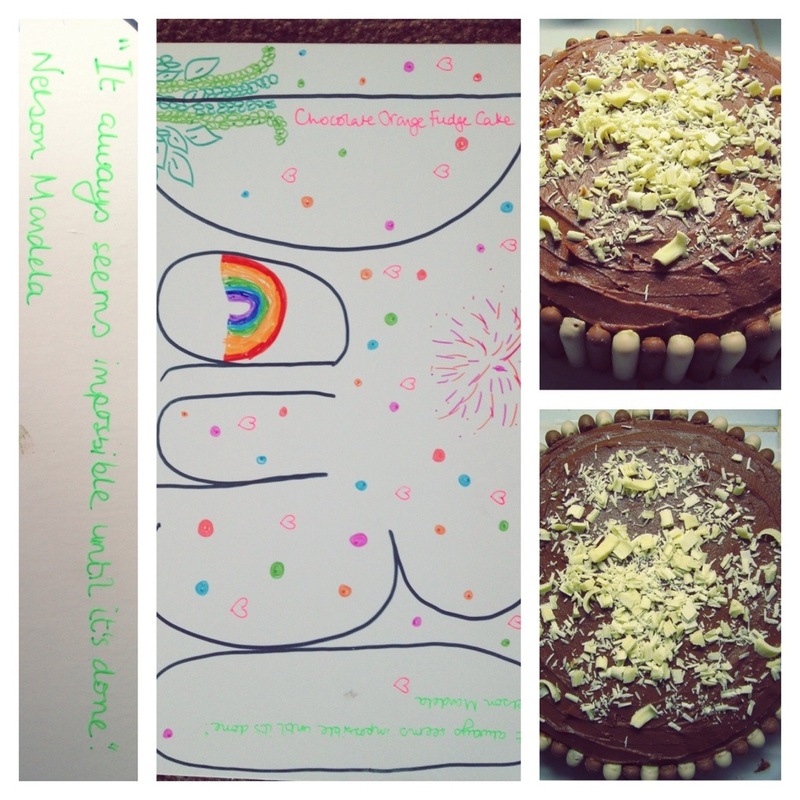 This entry was posted in 30 Days of Baking and tagged baking, cake, challenge, charity, chocolate, chocolate orange fudge cake, fudge, mental health, Mind, orange. Bookmark the permalink.